Teenage acne is probably the number one skin issue that most of us have experienced. But according to recent findings, cases of adult acne are increasing rapidly. Researchers have observed that as much as 50% of women are experiencing the adult acne today. Acne is the number one enemy of our skin because it not just makes you look ugly but it also in most cases, very painful. Even, they leave marks on your skin which often becomes our companion for long. Now, the acne we have in our teens is due to the hormonal changes our body goes through at that time which mostly goes off once we enter our 20’s. But the acne we have during our adulthood is not so innocent and you need to take serious care to get rid of it. Thankfully, there are easy home remedies to cure adult acne, and that’s what I am going to discuss in today’s post. If you are tired of adult acne and wondering about how to cure adult acne naturally, then here’s a must read post and you can’t afford to miss this. Whether it’s teenage acne or adult acne, it is mainly caused because of the combination of hormonal changes, stress, diet and lifestyle. Even if hormonal changes are natural, we can still control other factors like our diet, stress, lifestyle etc to avoid the occurrences of acne. Let’s take a closer look at the common causes of adult acne. What are the common causes of adult acne? Hopefully, by now, you have understood that adult acne is a little different than the acnes we have in our teens. In fact, these are a bit more serious kind of acne that does not occur simply due to hormonal changes in body, so what are the most common causes of adult acne? It is important to have a basic view of the factors responsible behind the occurrence of adult acne as that will help you prevent the acne. Listed below are the most common causes of adult acne. What are the common symptoms of adult acne? The severity of the acne varies from person to person but the basic symptoms are all the same. Listed below are the most common symptoms of adult acne. Now, that you have known about the common causes and symptoms of adult acne, it is time to learn about how to cure and get rid of it. So, let’s not waste much time and begin the discussion on the essential home remedies to treat adult acne. The home remedies for adult acne is more or less similar to what we use to treat teenage acne. However, there are some modifications because adult acne requires more care. This is due to the fact that teenage acne mostly goes away once you cross your teenage and become a full-grown adult but in case of adult acne, you will have to treat it properly in order to get rid of it permanently. Listed below are the most powerful home remedies to cure adult acne easily. Check them out. In case you thought that green tea was just meant for effective weight loss, then you are wrong because this is a wonder ingredient which is very beneficial in treating acne as well. This happens mainly because it helps in reducing the production of sebum which in turn, results in reduction of the occurrence of acne. Also, green tea is rich in healthy flavonoids, polyphenols and tannins that fights the bacteria and reduce the swelling or inflammation on your skin. Take some green tea leaves and steep it in boiling water for about 3-4 minutes. Then, after it has cooled a bit, apply it on your acne using a cotton ball. Allow it to dry, then rinse with water and pat dry. Alternatively, you may also drink green tea on a regular basis because some research shows it also effectively reduces acne. Like for example, drinking green tea is effective in reducing the levels of blood sugar and insulin in body which are known to at times lead to acne. Apple cider vinegar can be your next choice because it is an excellent ingredient as far as treating adult acne is concerned. It is antimicrobial in nature that fights various pathogens and prevent acne occurrence. Apple cider vinegar is filled with various organic acids that are found to be very effective against Propionibacterium acnes. In particular, it is succinic acid that has been proven to be great in suppressing inflammation caused by Propionibacterium acnes which in turn, prevents scarring. In addition to all of the above, the lactic acid present in it also improves acne scars. So, in short, apple cider is a complete cure for acne. Mix 1 part of ACV with 3 parts of water (You can increase the amount of water if you got sensitive skin). Then after cleansing your face, apply the mixture using a cotton pad. Allow it to stay for 15-20 minutes and then wash your face with water and pat dry. Use the remedy 2 times a day for fast results in curing acne. Studies have shown that 5% of tea tree oil gel was very effective against mild to moderate acne and so if your acne is not too severe, then tea tree oil can be a good remedy to try. Tea tree oil being antimicrobial in nature, can help you fight the pathogens causing the acne and soothe the swelling on your skin. The results of using tea tree oil may not be too quick but you will surely see significant improvements after a couple of months of using it diligently. However, do remember that it is very potent, so never forget to dilute it before applying on your face. And, it is also advisable that you do a patch test beforehand. Mix 1 part of the tea tree oil with 9 parts of water and apply the solution on your acne using a cotton pad. Keep it for some time and then wash off your face. You may apply moisturizer if your skin gets too dry. Repeat the process two times in a day for faster results in treating acne. Cinnamon is great for acne prone skin thanks to its antimicrobial nature which as per studies, helps fight the acne causing bacteria and effectively cures the acne. Cinnamon also has got anti-inflammatory properties which soothes your skin and reduces the inflammation caused by swelling. It is advised to use honey along with cinnamon to intensify the good effects. Both the honey and cinnamon are rich in antioxidants which also aid in the acne reducing process. Take a glass bowl and mix around 2 tablespoons of honey with 1 teaspoon of cinnamon. Then clean your face carefully and apply the paste on the affected portions of your skin. Let it stay for 10-15 minutes and then rinse it with water and pat it dry. If you do not want to apply cinnamon on your face, you may simply use the honey remedy for treating adult acne because honey itself works great as far as acne treatment is concerned. The reason why it is said to be effective is because it is antimicrobial in nature due to its low content of moisture, high concentration of sugar and a low pH which altogether inhibit the growth of the acne causing microbes. In fact, studies have shown that it is not just acne but honey is a perfect solution for several other skin disorders as well, so one should not underestimate the potential of honey in treating acne and other skin issues. Moreover, the antimicrobial nature of honey can also be attributed to the honey bees. This is because the bees add an enzyme named glucose oxidase while making honey which actually turns the glucose present inside honey into hydrogen peroxide which in turn, is toxic for the microbes. Take some raw organic honey and apply it directly on your acnes. Let it stay for some time and then wash off using water. Alternatively, you may also add a teaspoon of honey to any of your face masks that you usually use. The presence of tannins in witch hazel makes it a wonder ingredient as far as adult acne goes. This is because tannins are antibacterial and anti-inflammatory in nature which helps in fighting bacteria, reducing the inflammation and healing wounds. In fact, this ingredient is not just very effective against acne, it is used to treat other skin issues like skin burns, insect bites, eczema, bruises, dandruff, etc. as well. Take a small saucepan and combine 1 tablespoon of witch hazel bark with 1 cup of water. Let it soak for around 30 minutes and then boil it. Reduce to a simmer and cook it for 10 minutes keeping it covered. Now, remove it from the heat and allow it to sit for around 10-15 additional minutes. After that, strain the mixture and keep it in a sealed container. Now, it is time to clean your face and apply the mixture on your acnes using a cotton ball. Do this 1-2 times on a daily basis and you will notice significant improvements. The list of the essential home remedies to treat adult acne will remain incomplete without the mention of aloe vera because this is a magical ingredient for treating a wide range of skin issues including adult acne. The very first reason behind its effectiveness against acne is because of the presence of salicylic acid and sulphur which as per studies have already been proven to be very effective against acne. Aloe vera is also a great soothing agent that soothes your acne prone skin, cools it down and effectively reduces the inflammations. Take a fresh aloe leaf and extract the gel out of it. Now, use this gel as a moisturizer and apply it directly on your skin after cleaning it. Do this 1-2 times in a day for best results. Many do not believe in treating their acne problem using oils because it increases the oiliness of the skin which in turn results in more acne. Well, that is partially true but there are also exceptions to this. Like for example, coconut oil has been proven to be really effective against acne. The main reason which studies have found behind it is because of the presence of monolaurin, which being a great antimicrobial agent can inhibit the growth of acne causing bacteria like P.acnes and Staphylococcus aureus. So, you can definitely keep the coconut oil remedy as one of your options when it comes to treating your adult acne. I want you guys to use tea tree oil along with coconut oil to intensify the good effects. Take a bowl and mix around 1 teaspoon of coconut oil with 4-5 drops of tea tree oil. Then apply the mixture on your affected skin. Do this daily for maximum benefits in treating acne. The above-mentioned face masks using the natural ingredients to get your adult acne treated are great but in order to cure it permanently and to never let it occur again, you do need something extra. To be more specific, apart from the face masks, you also need to have an idea on what you eat, how you take care of your skin in general can help you greatly in preventing and treating adult acne and getting healthy and flawless skin easily. 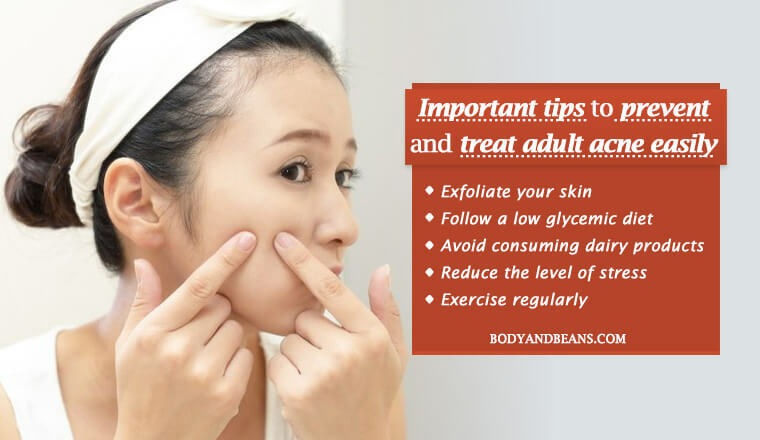 Listed below are a few of the most essential tips that you should follow to prevent and treat adult acne easily. You need to maintain a good skincare routine so that your skin is protected from all kinds of harshness all around. And, that skincare routine must include exfoliation of your skin. This is because exfoliating your skin helps in the top layer of the dead cells which often clogs the skin pores and lead to severe acne. It lets your skin breathe. In addition, exfoliation allows the anti-acne homemade facial masks to act on your acne more effectively thereby giving you faster results. There are various exfoliation products available in the market but since it is best to go natural, you can easily make an exfoliating scrub using coconut oil and sugar or salt and use it on a daily basis. Whatever you eat has a direct impact on your skin, so it is seriously important to eat right. For that, the very first thing that you have to do is to maintain a low glycemic diet. This is because research has shown that insulin and glycemic index is associated with the occurrence of acne and having high glycemic foods like sugary soft drinks, white bread, candies, pastries, cakes, doughnuts, processed foods etc. can result in the occurrence of severe acne. In contrast to the above, studies have shown that maintaining a low glycemic load diet significantly improved the condition of acne. So, it is best to have foods that have low glycemic index like for example, fruits, vegetables, nuts, legumes etc. In spite of the fact that more research needs to be done whether dairy and dairy products consumption can lead to acne or not, few studies have already confirmed that dairy consumption can lead to increase in acne occurrence especially in the teenage years. So we cannot fully ignore the fact that acne will not occur to you if you drink milk and its products when you are an adult even. The thing is that drinking milk and its products expose you to hormonal changes leading to acne. So, it is best if you avoid dairy and dairy products in case you have got an acne prone or sensitive skin. If you are serious about avoid or getting rid of acne, then you have to reduce the level of stress, because there is no denying of the fact that excessive stress is one of the vital causes behind acne and studies have already proven it. High level of stress increases the secretion of sebum and increases your inflammation making your acne condition even worse. Moreover, studies also show that it can slow down the wound healing process which will in turn, lead to slowing of the repair of your acne lesions as well. However, treating the problem of stress is never easy but you can take the help of relaxation techniques to get rid of acne. I will suggest you to get enough sleep, try out meditation, take deep breaths, practice yoga etc to get rid of stress. 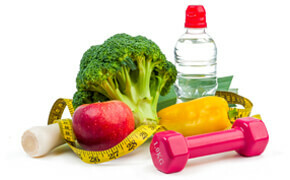 We all know how important it is to work out on a regular basis to keep us in good health. But did you know that doing regular exercise can specifically help you prevent and treat adult acne as well? Exercising regularly improves the blood circulation in body which keeps your skin cells nourished and helps in prevention of acne. Also, studies have confirmed that regular exercise plays a big role in regulating hormonal levels in your body which also reduces the chances of having acne. In addition, exercise also benefits in combating stress and anxiety which is also beneficial in preventing acne. So, if you are serious about preventing or treating acne, you have to make sure that you hit the gym every day. You may like to do some walking, cycling, running, swimming or hiking regularly. Over to you: how do you treat adult acne naturally? Having acne all over your face is really frustrating because besides making you look ugly they are in most cases very painful. Also, they often leave permanent marks on your skin which is even worse. So, whenever you are treating your acne, you need to make sure that you opt for remedies that will not just reduce the acne but will also effectively reduce the acne marks. And, for getting the best results, I always prefer going the natural way. 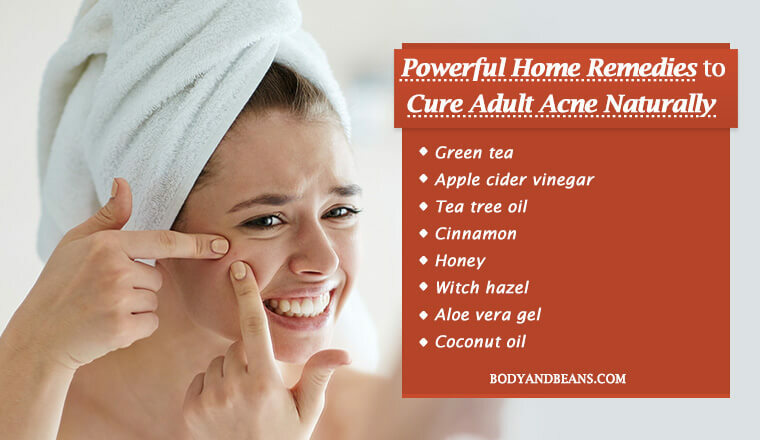 While consulting a dermatologist is a safe option in case of severe adult acne, you may also like to try a few of the home remedies to cure adult acne naturally. The natural ingredients are very much safe in comparison to the chemical based creams and lotions that make false promises of giving you overnight results in treating teenage and adult acne. I have already talked about 13 of the most powerful home remedies to treat adult acne naturally that you may like try. 8 of them are the face masks using various healthy ingredients with anti-acne properties, the rest of them include some of the interesting tips that will not just reduce acne but will also prevent its occurrence. So, check all of these carefully and apply some of these get maximum benefit in curing adult acne. I am sure that the remedies will work perfectly if you use it correctly. But, I want you guys to share your feedbacks in the comment section, after trying these remedies. Also, if you know any other natural home remedies for adult acne treatment, then feel free to share by commenting below. And, if you like my post, then please like, comment and share it with others. Until then, stay beautiful and do not let the acne ruin your day.